Here is your chance to get your hands on our tool for free. And when we say “free” we do mean free without any obligation or similar. All it costs is a little of your time. But first: a little backtrack. This week the RadioAnalyzer Windows Suite is shutting down permanently. And though that sounds like bad news, it is actually the best news possible for our users. It means we have completed the move to RadioAnalyzer.com including bug-fixing and portability to all device types. In other words: RadioAnalyzer’s powerful analytics suite is now a beast of a website and clients can access the business intelligence tool from any pc or mac, any smartphone or any tablet. How about that for a convenient and flexible work environment? (Though you need to use Chrome to get the best possible experience, so a few restrictions still remain, but we figured that is ok). We want to celebrate the occasion, so for our upcoming tour we are bringing a fistful of free trial passes, valid until mid April. The usernames and passwords on the passes give FULL ACCESS to the RadioAnalyzer Pro product, working on data from a client who have kindly given us permission to use their data for this purpose. We are re-naming them “Test Radio” for the time being, just so trial users can easily navigate the system and always know which station they are “working for”. We think everyone who is interested in trying us on for size should benefit, so we have decided to broaden the “RadioAnalyzer on Tour Offer” to also cover people we don’t meet on our way in the next couple of weeks. 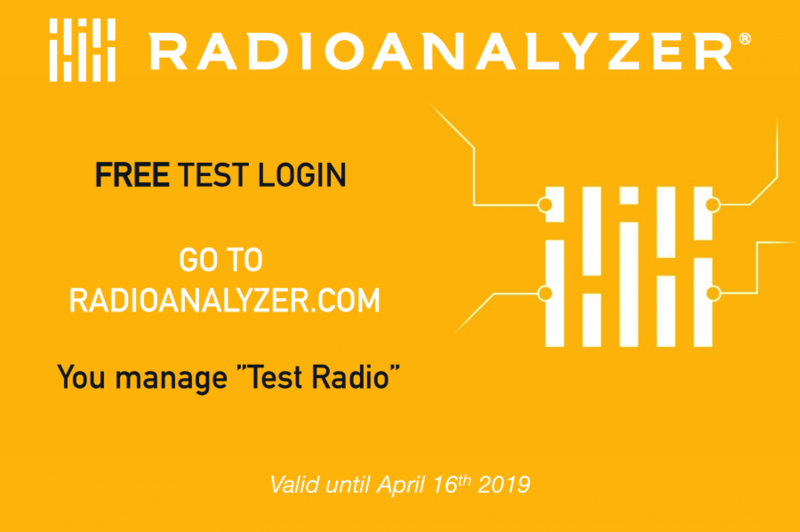 So if you, dear Friend of Radio, want a pass, just e-mail info@radioanalyzer.com and get your own access. Offer ends on April 2nd and access ends on April 16th.